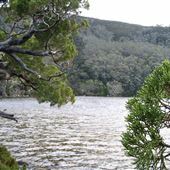 Lake St Clair (leeawuleena - meaning 'sleeping water') is at the southern end of the Cradle Mountain- Lake St Clair National Park. It is Australia's deepest lake. 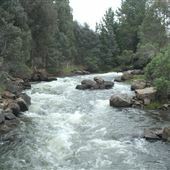 This canoe course is regulated by Hydro Tasmania. They control the flow of water in the course. If you need access to the course - which also has a bridge across the short river and is ideal for filming - you will need to contact Hydro Tasmania's Brand and Communications unit. 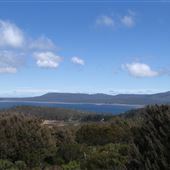 Mt Field National Park is 90 mins from Hobart. 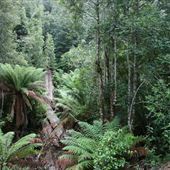 It has a number of lakes, ancient Pencil and King Billy Pine trees and cool temperate rainforest around Russell Falls - a three-tiered waterfall. Great Lake and Miena are a popular destination for trout fishing. Miena is very cold in winter and can be very hot in summer. 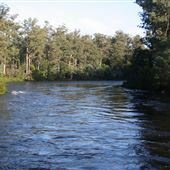 The Gordon River flows from the South West National Park into Macquarie Harbour. Low-wake vessels are allowed to cruise this river which is stained dark by the tannin from the button-grass plains. 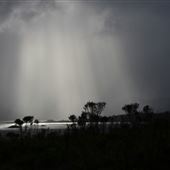 It is also usually sheltered from the wind. The reflections in the dark water can be startling. 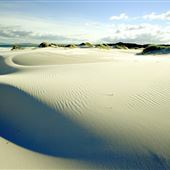 The Henty Dunes are an area of huge white-sand dunes 14 kms from Strahan. 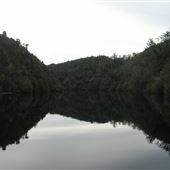 Tahune Adventures is on the banks of the Huon River in southern Tasmania. It has a number of walking tracks, an Airwalk in the canopy of the trees, a cable glider, a concrete bridge, swing bridges and a cantilevered platform over the river, accommodation and a restaurant. 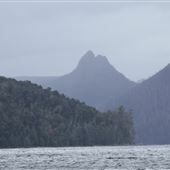 Mt Barrow has similar rock formations to Ben Lomond. The road in is a bit less daunting. Ben Lomond is both a ski field and National Park. 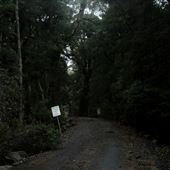 The last part of the road up the mountain is called Jacob's Ladder. It is steep and narrow with hair-pin bends, There are a number of ski lodges at the top, so medium-size trucks must travel up it. 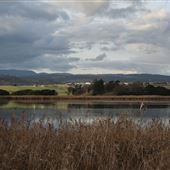 Mt Barrow is the site for the TV and Communications transmitters for the Launceston Region. 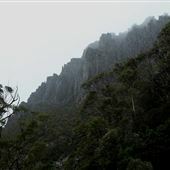 Like its neighbour, Ben Lomond, it has forests on the lower slopes and jagged rock formations on the summit. It snows sometimes in winter and is subject to cloud and high winds at times. Bothwell is an historic town in Tasmania's Central Highlands. 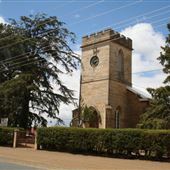 Bothwell has a great deal of colonial architecture and Gothic revival churches. 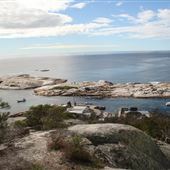 Bicheno is a small coastal town on Tasmania's spectacular East Coast. 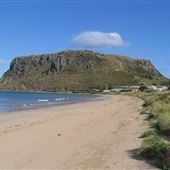 It has granite cliffs and coastal rock formations, white sand beaches and islands. 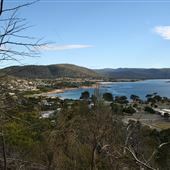 Bicheno is both a centre for the local community and a tourist destination. 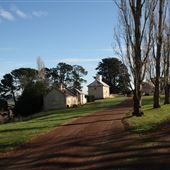 Accommodation is plentiful but you will need to avoid holiday periods. 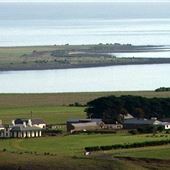 Stanley is an historic township in a truly amazing location. 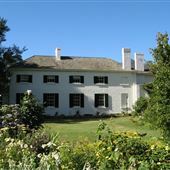 Much of the town is in its original colonial state dating from the 1830s. "The Nut", an unusual land formation which towers above the town is the remains of a lake of lava from a long-dead volcano. 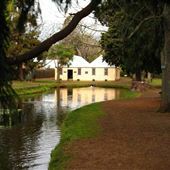 The Salmon Ponds is a heritage trout hatchery in a traditional English garden setting where you can feed the trout and experience the history of trout fishing. 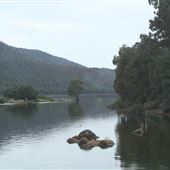 Access is controlled by Inland Fisheries Service Tasmania. An extensive menu is provided by Pancakes by the Ponds. Red Knoll Lookout is close to the southern end of Lake Pedder. To the north is the lake and Scotts Peak. 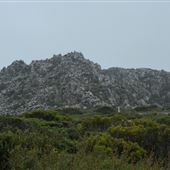 To the south is a range of ragged mountains know as the Western Arthurs. 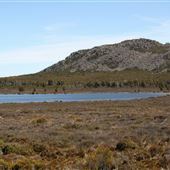 Pine Lake is a amall glacial tarn in the Central Highlands Conservation Area. 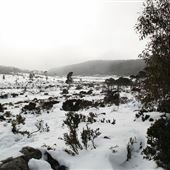 It is home to alpine vegetation and an ancient native Tasmanian tree known as the Pencil Pine (Athrotaxis cupressoides) which can live for up to 1200 years. 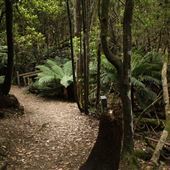 Filming access is via a permit from Tasmanian Parks and Wildlife Service. 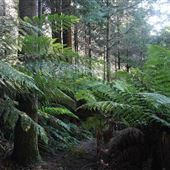 Myrtle Forest is on the northern side of the kunyani/Mt Wellington Par. 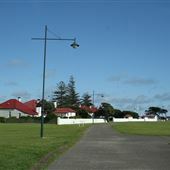 It is controlled by the Wellington Park Management Trust. 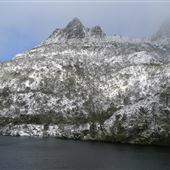 Cradle Mountain National Park is an iconic Tasmanian location. 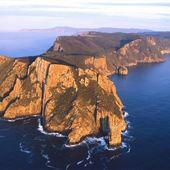 It is located within the Tasmanian World Heritage Area and managed by Tasmanian Parks and Wildlife Service.